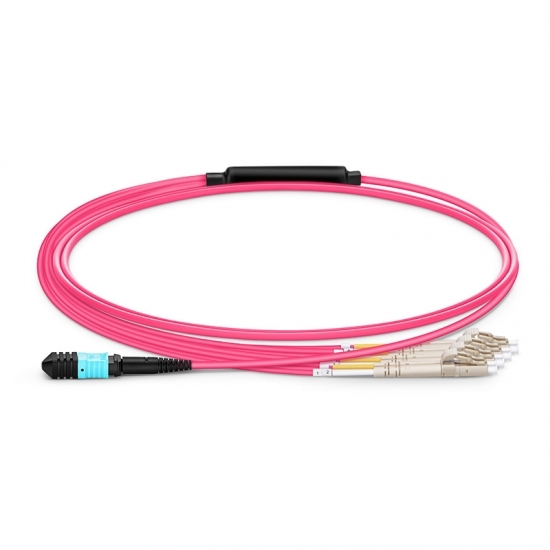 Ultra low insertion loss MPO-LC harness/breakout cable for 40G to 10G or 100G to 25G connections. 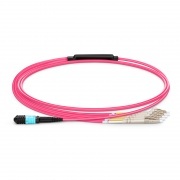 The OM3 multimode breakout cable is recommended for high-density fibre patching between data centre MDFs (main distribution frames) and IDFs (intermediate distribution frames). Our MPO-LC breakout/harness cables are fully tested for low insertion loss and back reflection on every connector and attenuation loss that meets or exceeds current industry standards. How to breakout 40G link into 4x 10G for going to different purpose? A type-B female MPO/MTP-4x LC harness cable is required. The following shows the 4x 10GBASE-SR SFP+ transceivers interconnection with 1x 40GBASE-SR4 QSFP+ transceivers by one MPO-4LC harness cable directly. Max 0.35dB, a typical lower than 0.15dB on MM Low Loss Ferruler and the MPO connector assembly is made by SENKO. Utilizing tightly toleranced ceramic ferrules to ensure consistent low loss and ease of assembly, offering great performance with very high repeatability. Corning ClearCurve multimode fiber is designed to withstand tight bends and challenging cabling routes with substantially less signal loss than conventional multimode fiber. With BIF, our cable is designed for improved bend performance in reduced-radius applications such as residential or office environments which have less bend sensitivity. The Ultra Low IL was suitable for our data center. I tested it with my switches, and it operated well. The items arrived in a timely manner and the items matched the descriptions as one would hope for. They were good for my 10G transceivers. The LC connectors were durable and have low insertion loss. I got it to complete my project. 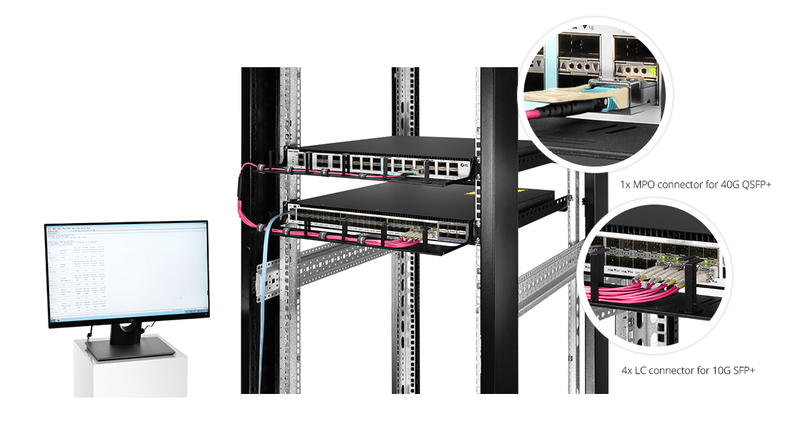 It is in good working and has advantages of low signal loss when I used it in our high-density data center. Works as expected! Good cable and nice price. No issues with orders and the cables were satisfied with my needs. regular customer, I have bought many cables. Also, the MTP/MPO cleaner is really recommendation from their sales. Their prices are excellent and delivery time is outstanding. Shipped on time but packaging could be better, also some offers on discounts are very nice. I have no complaints about the products. Quick delivery and accurate description also easy to installation. I will use the site again next time. This is some great cable. I'm not a cable expert, but I say it is great because it feels and looks like a great cable. Each end with great connection. I also bought some cables on Amazon before, and it felt like they had gone on some fad diet. They were very thin, the outer sheathing was loose and floppy, they just looked and felt terrible. Best of all, it works perfectly! Connections are firm and very well made cable. You won't be unsatisfied!